It’s rare for me to await the release of a game right on day one; I’ve only done that for StarCraft II: Heart of the Swarm and Guilty Gear Xrd -SIGN- in recent years, as far as I can remember. This is one of the titles I was looking forward to this year because I love the first game, so I had to cover this game every step of the way. Therefore, here are my impressions of Hotline Miami 2 after playing it for around 3 hours or so. Perhaps it’s a bit sad that it’s the last game in the series, making it a duology, but that also means they’ve put everything they could into this one. The formula had already been perfect with the first game, so they could add a few more parts and spruce it up with some more visual style without going overboard and risk embellishing it too much. But then again, it would’ve been pretty hard to not go overboard anyway, considering the material involved. From the reviews and comments I’ve read online thus far, the little bits of negativity weren’t that surprising. This sequel was expected to be more divisive since the writing wasn’t going to be clean and immediately coherent with all the crossing story arcs and the varied mechanics involved. It’s certainly not as simple and straightforward as in the first game, but it did address the complaint over length by giving it a lot more meat to bite into and more blood to paint the walls with. NOTE: This is a blog entry expressing initial impressions on Hotline Miami 2: Wrong number after playing through its first few chapters. There are spoilers here for the purpose of analysis, so please be warned. A link to the full review of the game will be posted here once it has been published. 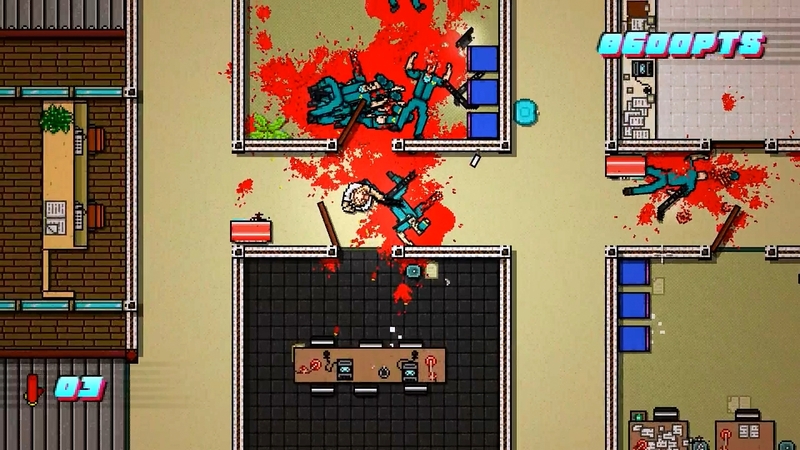 My first playthrough of the first Hotline Miami was in 2013, similar to a lot of people who never caught wind of it in 2012 when it suddenly blew up from out of seemingly nowhere. Its style and gameplay were so right up my street that I could never uninstall it and I still listen to the soundtrack from time to time while working. The only thing missing that would make it absolutely perfect for me is to make it cyberpunk, almost like a top-down action version of Neuromancer or Shadowrun. The only gripe I had was the cutscenes were not skippable, which is alright if you’re following the story anyway, but not good in certain instances. If you die during a boss fight — and you will in your first few attempts since that’s what Hotline Miami is all about — then you’ll have to go through the same cutscenes before getting your next chance. This is disruptive to the player’s rhythm and can be very annoying, at least for me. I wanted to see if the sequel would have this fixed. 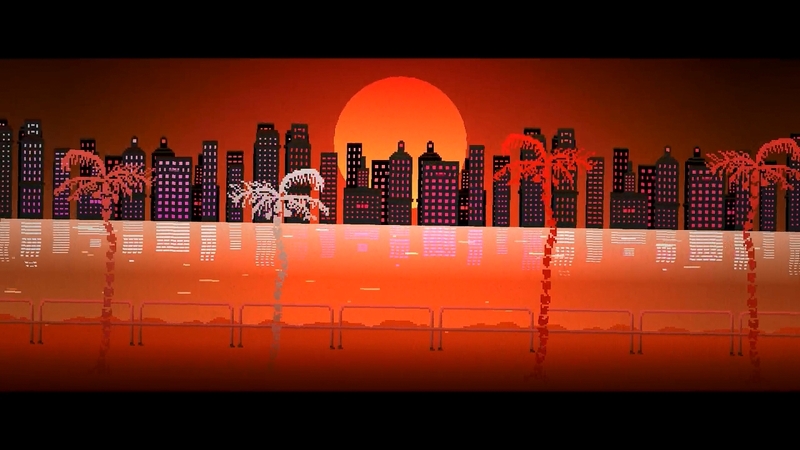 The graphics are similar to that of the first game, but the interface and some other parts have been revamped to hit the retro aesthetic further. 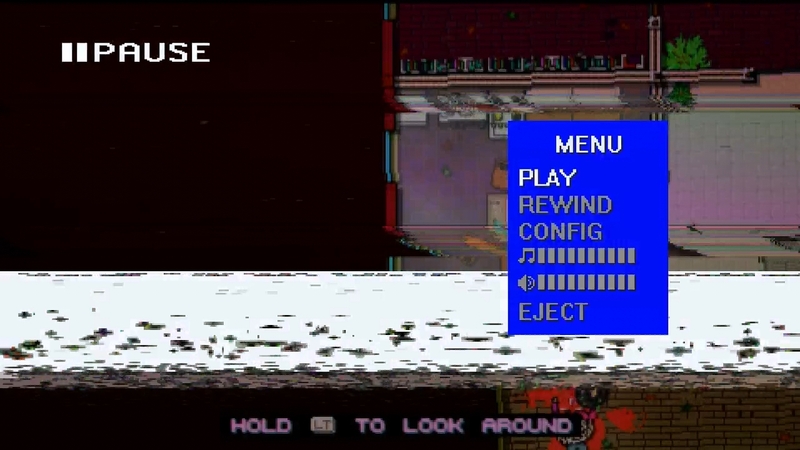 I especially like what they did to the pause menu, making it look like the janky menus in old TVs and VCRs (except these work and don’t need manuals to understand). There’s also a lot more detail to go by, while the first game’s visuals looked a bit more dream-like and hallucinated, although not by much. I can’t help but use scanlines, noise, and chromatic aberration in Photoshop because of this look. Looking through Hotline Miami 2’s soundtrack list, I recognized a few of the artists, especially Perturbator. I had been listening to a lot of dark synth and 80s-inspired music, so the tracks here were the right fit for both the game and my preferences, which made the experience twice as enjoyable. Having 49 tracks also means that there’s a lot to dig into even after I finish the game. Too bad Trevor Something isn’t in here as well; he would have fit right in. 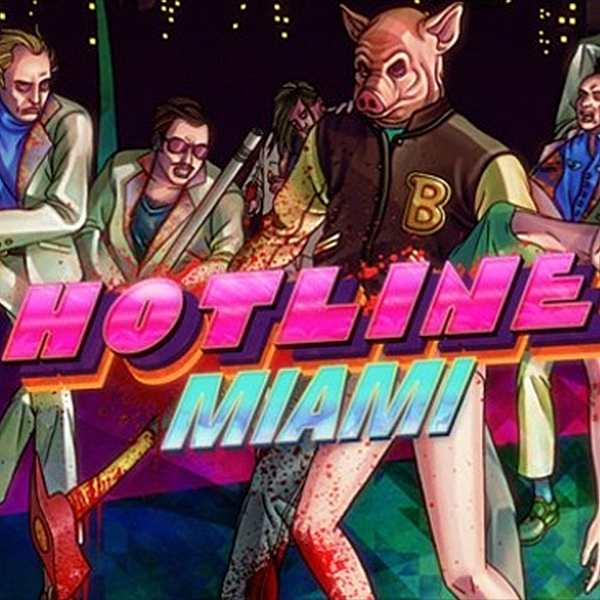 There’s a lot more going on in the story of Hotline Miami 2, with more characters and over-arcing narratives. It’s no longer just one dude with many masks, but multiple characters with each his own style of mask and unique abilities. There are also special levels like that Vietnam War one, wherein you have your rifle and not much else to kill (insert derogatory term for communist guerrillas here). The story itself may be batshit, but that only lends to its bizarre dynamism through these new additions. Still as bloody as ever. To that end, the gameplay in general has a bit more restriction depending on the current character in particular levels, but that does add more dimension to the experience by having more settings other than building interiors and more ways to play other than just the default “pick up weapons whenever you like” mode. I particularly liked the character who held guns in akimbo due to the two-way shooting mechanic, which presents new challenges and possibilities. Most people see this as an action game, but I’ve always seen the Hotline Miami titles as action puzzle games. The key is figuring out the sequence of moves you can do to effectively clear the level. In most cases, you will have to die several times to know where all the enemies are, their movement patterns, and which parts of the level are the least defended. Of course, you still have to be good with controlling your character, but that’s only one part of the equation. If you think that Hotline Miami 2 lets you turn your brain off (like the Burnout racing games), then I think you’re mistaken. It’s a good thing indeed that Hotline Miami 2 has maintained what I view as its quintessential experience. It should still adrenaline-pumping gameplay for most, but my style of play in it is more cautious and the only penalty to that is a lower time bonus in the score. Don’t skip them in the first playthrough though. The story does get good here. Also, the cutscenes can be entirely skipped now by holding the right mouse button. As I mentioned, that was a little niggle that annoyed me in the first game, so I’m glad that it got addressed here. UPDATE (2015.03.13): It turns out that cutscenes can also be skipped the same way in the first game, but wasn’t detailed as clearly. Well, that’s what I get for not paying attention. Would I Recommend Hotline Miami 2? 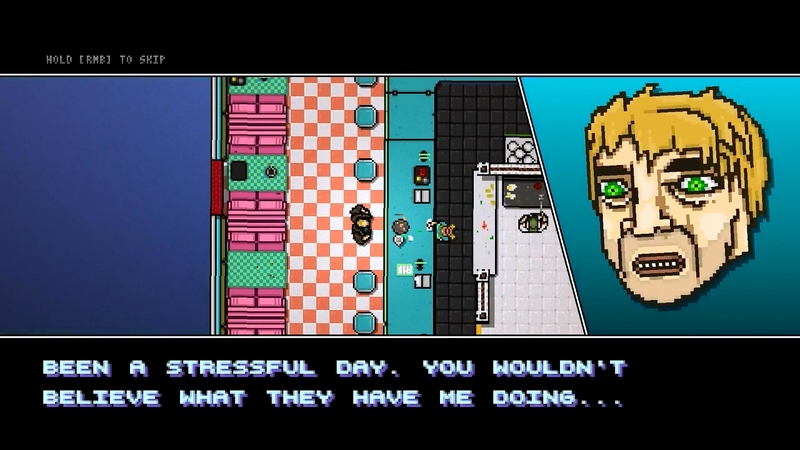 Yes, even if you haven’t played the first Hotline Miami. Even if you point out that I’m being incredibly biased here, that’s just because I’ve been greatly impressed with this sequel. While it wears other people down, the frustration only fuels me to play more. The broken and tripped-out retro aesthetics and soundtrack also float my boat, although I’m not sure if it does with others as well. There’s no need to play the first game beforehand if you’re new to the series because the mechanics are mostly the same and you may even want to get a feel for the new ones in this sequel if you’re a bit impatient. But if you do play this and get really frustrated, then that’s when you should pick up the first game and try to finish that first. However, if you’re not into games where you die constantly or depict gratuitous amounts of hyper-violence, then maybe you should skip the Hotline Miami series altogether. But then again, pixelated and cartoon-style violence and gore seems to make a certain percentage of the population cringe anyway; it just so happens that Hotline Miami 2 takes it several steps further.